Dr. Romasa completed her Graduation from University of Health Sciences, Punjab Pakistan and did her Residency in Medicine, Anaesthesia, Obs & Gyn etc. Dr. Romasa is pursuing her post-graduation MRCGP from Royal College of London. Dr. Romasa has rich and varied experience of over 11 years as General Practitioner. She has worked in NMC Speciality Al Nahda for 6 years and recently joined NMC Hospital DIP. 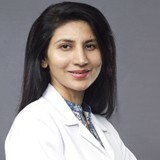 Dr. Romasa is fluent in English, Hindi, Urdu, Punjabi.